Our new Fabric Palettes Catalogue for 2008 has now been printed and is being sent out. There are lots of new fabrics showcased and Nik has ben working hard to get all the fabrics and packs ready. We have lots of new ranges such as Textures, Leaves and Country Store as well as many more fat quarter packs including over 20 twenty Kaffe Fassett packs. Strip rolls have been very popular recently and we have a number of new books which highlight projects that you can make with them. We also have a new Strip Roll template set from Marti Michell which can help you easily turn your strips into finshed quilts. Finally we have eight new Strip Rolls which focus on a number of our fabric ranges. Brief details on the fabrics and where to find them on our online store can be found here. 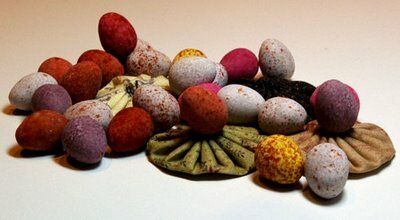 Well it looks as if it may be a cold and damp Easter break here in the UK, so best be surrounded by as many Easter Eggs as possible, and if that fails some of your favourite needlework projects. Today I have put up two new fabric ranges, Lotus Hana and Passion Fruit. Both of them feature a palette of purples and lavenders but they are very different prints. Personally I think the Lotus Hana (also see the Hana range which will be one of our Fabric Palettes for 2008) is a lovely range of fabrics. I have added a number of new Kaffe Fassett Fat Quarter Packs to the Kaffe Fassett area. If you have a favourite design from Kaffe then you can now sample his fabrics as fat quarters. 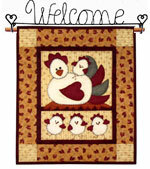 Finally we have an offer for 2008 for fabrics purchased through the Bargain Basics Club. Members receive each quarter a pack of 25, 100% cotton fabrics. Further quantities of these fabrics can be purchased at the reduced price of £5.40/m from £6/m for 2008. Full details can be found on our Bargain Basics Club Page. Another completely new range we have just launched is our Country Store range. These are small scale designs such as dots, stars, small flowers and checks in warm, country colours. There are 30 fabrics available by the metre or as fat quarter packs, a charm pack and special collection pack or as one of our new strip rolls with 30 fabrics cut to 2 1/2" strips. We have a new range of Oriental-inspired patchwork fabrics called Hana. Groups of the fabric are available as four fat quarter packs or as a Special Collection pack, or you can buy them individually by the metre. A lovely fabric range with a fine metallic overprint.